Ms Sumaila Naeem Ch – Being an agriculture country this very sector has become backbone of Pakistan’s economy but in reality farmers’ community across the country is facing challenges in getting better yielding as they are receiving substandard seed, fertilizer and insufficient water for their crops. Pakistan has been declared as water scarce country where farmers do not find sufficient water for their harvest. Experts are of the view that in near future, farmers will no longer be able to grow water-intensive crops like sugarcane and rice in the country, if government would be unable to take serious action against the availability of water for formers. It is fact that rivers and canals are playing a pivotal role in irrigation of crops but it is also true that almost one million tubewells are working in the country. Out of more than one million irrigation tubewells in the country about 650,000 are being run on diesel-operated engines and 350,000 on national electricity grid. However, with worsening electricity crisis in the country since many years and high diesel cost, farmers have no option but to to find alternative cost-affective sources. Solar energy is the cheapest means of running tubewells as solar energy is dependable, clean, cost effective and feasible. It is also an immediate solution for converting tubewells on sustainable basis. Though, solar energy-based tubewells’ initial cost is high but all cost could be recovered within a period of just five years. According to an estimate, per hour cost of running an average-sized tube well on electricity is Rs138, on diesel it is Rs173 and on solar energy it is Rs83. Farmers who have tubewells with less than 50 feet watertable can save Rs131 per hour and hence Rs 314,400 per year with solar tube wells compare to diesel-run tubewell. A study carried out by International Waterlogging and Salinity Research Institute (IWASRI) revealed that 42 percent of Punjab land is irrigated using wells and these tubewells are working with the help of diesel and electricity. At present, half of Pakistan’s population is food insecure and if the current trend of water depletion continues in Punjab and parts of Khyber Pakhtunkhwa – two regions that are home to 80 percent of Pakistan’s farming population – food production and farming income will suffer, it is revealed. The government should not only introduce water-efficient seed varieties in water-stressed areas and train farmers on using drip irrigation and sprinkle irrigation to save the scarce resource but should also convert all tubewells on solar energy system instead of keeping them run on diesel and on national grid. It would be not out of context to mention here that few years ago Punjab government had signed MoUs with German and South Korean companies to convert at least 800,000 tubewells of Punjab to solar system but perhaps the priorities of government have now been changed. Punjab Chief Minister Mian Shahbaz Sharif’s efforts in this regard are laudable who wooed German company. 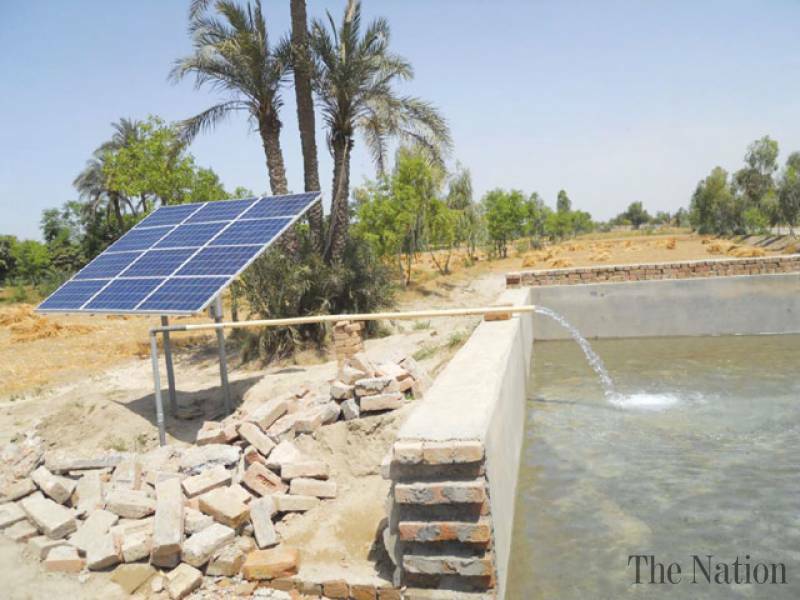 Shahbaz was of the view that these 800,000 tubewells in Punjab supposed to be operated on solar energy can improve the performance of provincial agriculture sector and can significantly increase per acre yield. He had asked German experts to evolve a practicable project for Punjab which should be cheap and beneficial for farmers. Shahbaz Sharif also asked German company to invest in this highly important project on pay and earn basis as the dream of agricultural development and prosperity could never become true without developing the agriculture on modern lines. He said that the solar energy tube-wells would boost agriculture sector in the country, as the government was taking effective steps to modernise agriculture and putting it on the road towards the goal of self-reliance. To convert 800,000 tubewell on solar energy is not an easy task as selection of solar tubewell systems requires technical awareness; the product can only be successful if the vendor, pump motor, solar panel and inverter/ controller and technical standards are strictly followed. While the initial costs of converting these tubewells to solar energy system is high which farmers cannot pay. Certainly, they need credit from schedule banks to buy the solar operated irrigation systems. If banks can give credit facility to common man for the purchase of cars, why they cannot play their role in enhancing yielding of the country. The banks should also give financial assistance to farmers for converting their tubewells to solar energy system and in return they could pay back in five years. It is high time that government should take steps to teach farmers the ways as to how effectively irrigate crops with less water as well as providing farmers with water-efficient seed varieties and train farmers on using drip irrigation and sprinkle irrigation with the help of solar energy-based tubewells and put the country on the road of food security and prosperity. I see, that your blog needs fresh & unique content.